Although many things about this case are troubling, perhaps most worrisome is that Mr. Hernandez might never have received this sentence if he had been sentenced in another part of the country. The Sentencing Commission also reported to Congress that the practice of "stacking" § 924(c) charges happens in very few districts. The Commission's data showed "no evidence that those offenses occur more frequently in those districts than in others." Id at 361. The Sentencing Commission thus concluded that "this geographic concentration is attributable to inconsistences in the charging of multiple violations of § 924(c)." Id. at 361-62. As it happens, the Southern District of Florida, where Mr. Hernandez was sentenced, is one of the districts recognized as exceptionally prolific in charging § 924(c) crimes. In fiscal year 2010, at least one in thirty-five of our entire nation's § 924(c) sentences came from the Southern District of Florida. Id at 276. The Southern District of Florida was one of only twelve districts in the country that reported having over 50 of these cases that year. Id. For the same period, 38 districts reported having ten or fewer. Id. We must treat people with respect and dignity even though they are suspected of a crime. * * * The Constitution enshrines a fundamental right to be free of unwarranted restraints. Thus, we hold that if the government seeks to shackle a defendant, it must first justify the infringement with specific security needs as to that particular defendant. Courts must decide whether the stated need for security outweighs the infringement on a defendant’s right. This decision cannot be deferred to security providers or presumptively answered by routine policies. All of these requirements apply regardless of a jury’s presence or whether it’s a pretrial, trial or sentencing proceeding. Criminal defendants, like any other party appearing in court, are entitled to enter the courtroom with their heads held high. The policy that defendants challenged here isn’t presently in effect. Thus, although we hold that policy to be unconstitutional, we withhold the issuance of a formal writ of mandamus at this time. Manuel Noriega has died. 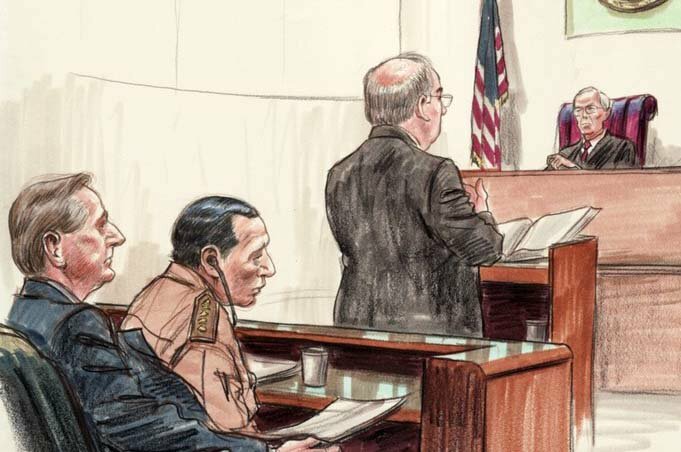 Here's a sketch of him by Arthur Lien from his 1992 trial before Judge Hoeveler. He received a sentence of 30 years and served 17. Because he was a prisoner of war, he had to receive a jail cell in accordance with the Geneva Convention. That meant he had his own cell with TV, a computer, and exercise equipment. Corrections officers called it "the presidential suite." RIP AUSA Beranton J. Whisenant Jr. He was only 37. So sad. I did not know him, but I heard he was a good guy. Please feel free to remember him in the comments. Uh oh... get ready for the hate mail. How could you rule that dogs aren't people? And to the list of infamous Dracos, add Defendant-Appellant Draco. Draco is a police canine who was involved in the apprehension of Plaintiff Randall Kevin Jones. Unfortunately, Draco inflicted some serious damage on Jones when Draco refused to release his bite. 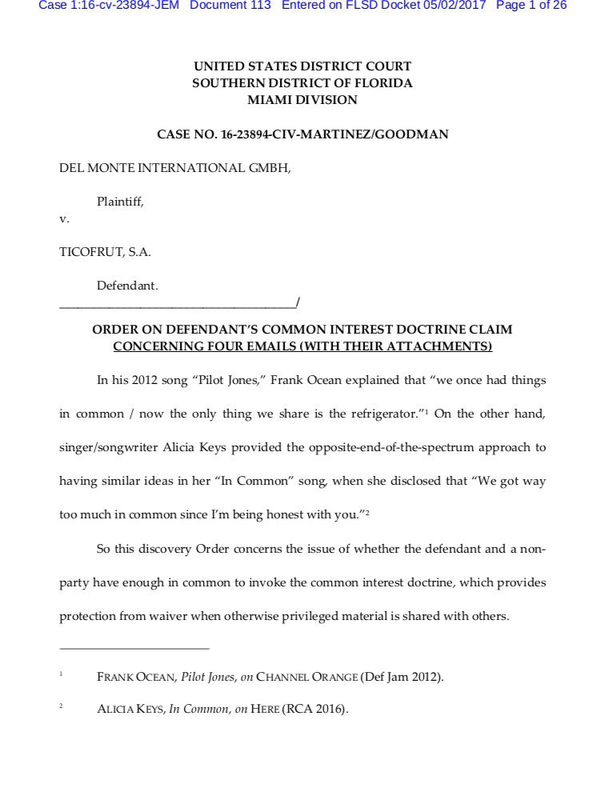 Jones sued Draco, among others, for negligence. Georgia law by its terms, however, does not provide for negligence actions directly against dogs. We therefore hold as much today and reverse the district court’s denial of Defendant-Appellants’ motion to dismiss Draco. But while Georgia law does not allow for a negligence suit against a dog, it does permit negligence claims against a state officer who is not entitled to official immunity. Title 42, United States Code, Section 1983 likewise authorizes an action against a police officer who employs a dog in an exercise of excessive force. And Jones also sued the officers responsible for Draco’s encounter with Jones. In response, Defendant-Appellant Officers invoked official and qualified immunity and moved to dismiss. The district court summarily denied Defendant-Appellant Officers’ motion. Today we must reverse that denial and dismiss the claims. Jones has failed to allege facts establishing that the officer acted with malice, so the officers are entitled to official immunity. Nor does binding precedent allow for the conclusion that Defendant Officers’ employment of Draco in the circumstances of this case violated Jones’s clearly established rights, so the officers have qualified immunity. *See J.K. Rowling, Harry Potter and the Sorcerer’s Stone (1997); J.K. Rowling, Harry Potter and the Chamber of Secrets (1998); J.K. Rowling, Harry Potter and the Prisoner of Azkaban (1999); J.K. Rowling, Harry Potter and the Goblet of Fire (2000); J.K. Rowling, Harry Potter and the Order of the Phoenix (2003); J.K. Rowling, Harry Potter and the Half-Blood Prince (2005); J.K. Rowling, Harry Potter and the Deathly Hallows (2007). You be the judge -- former Congressman and Huma's husband Anthony Weiner pleaded guilty to a count of transferring obscene material to a minor. It carries a maximum sentence of 10 years. His guidelines are 135 months at the low end. The government has agreed to recommend a sentence of 21-27 months in this plea agreement. What will the judge do? What would you do? Who could read all of this? The U.S. Court of Appeals for the Eleventh Circuit issued a 284-page en banc opinion Thursday saying that smokers who won a class action against tobacco companies can also file individual lawsuits. The judges had some fireworks. Three wrote dissents. One called the process a “chaotic poker game” and said judges should “stick to our day jobs” instead of advocating for plaintiffs. In the end, the judges upheld the lower court decision in favor of Theresa Graham against R.J. Reynolds Tobacco Co. and its affiliates. Judge William Pryor wrote the majority opinion. “This appeal presents the questions whether due process forbids giving a jury’s findings of negligence and strict liability in a class action against cigarette manufacturers preclusive effect in a later individual suit by a class member and, if not, whether federal law pre-empts the jury’s findings,” Pryor began. Big cheer for the 11th Circuit for posting same day oral arguments on its website. Apparently this has been happening for the past few weeks. On Tuesday, after 12 months of politely but pointedly remaining totally silent and unresponsive in court, Petion resumed speaking to judges: He apparently decided it was in his best interest to accept a plea agreement offer from the prosecution. “Guilty,” Petion said when U.S. District Judge Robin Rosenberg asked him how he wanted to plead to two federal drug-trafficking and weapons charges. Prosecutors said they will recommend 20 years in federal prison when he is sentenced in August, but the final decision on his punishment lies with the judge. The maximum possible penalty is life in prison. He remained imprisoned the whole time and only succeeded in delaying progress in his case for 12 months. Earlier this month, Petion finally resumed speaking to his attorney after two in-depth mental health evaluations showed that there was nothing physically or mentally wrong with Petion and that he was legally competent for the case to proceed. The experts said he was faking mental illness. After he was determined to be mentally competent, prosecutors made a plea offer and said they were considering filing a more serious charge, with a harsher punishment, if he planned to go to trial. Meantime, we still have no U.S. Attorney. As far as I know, all of the finalists are still being considered. I imagine that we will have our nominee by the end of the month. It will be interesting to see if the nominee will accept the position and work for a Trump/Sessions administration. A juror dismissed from former U.S. Rep. Corrine Brown’s fraud trial told other jurors “the Holy Spirit” said Brown was innocent as the jury deliberated, according to a transcript the trial judge unsealed after a hearing Monday. U.S. District Judge Timothy Corrigan’s decision to remove that juror will evidently become part of Brown’s effort to challenge her conviction last week on 18 out of 22 fraud and tax charges that could lead to years of imprisonment. Although he hadn’t requested one Monday, Brown’s attorney, James W. Smith III, told reporters last week he planned to seek a new trial. Corrigan acknowledged disagreement over the juror’s dismissal during a hearing that touched on a range of subjects involving the now-discharged jury. “It is obviously a matter of contention in this case as to whether the court acted correctly,” Corrigan said. “I thought it was the right decision, but I know you have rights and I want you to be able to take advantage of those,” the judge told Smith before denying a pair of oral motions that would have raised the possibility of attorneys talking with some jurors about their verdict. "A foolish consistency is the hobgoblin of little minds, adored by little statesmen." --Ralph Waldo Emerson. It's hard to believe that we are going backwards and this is the criminal justice system that we will now be operating in. Which judges will stand up to the executive? Which judges will write sentencing orders explaining why prosecutors are asking for sentences that don't comport with 3553? Which judges will say enough is enough? Boyd had challenged Alabama’s new lethal injection protocol, alleging it violates his Eighth Amendment right to be free from cruel and unusual punishment. Instead, he noted, legislatures in Utah and Oklahoma have approved the firing squad, which has a good track record of “speed and certainty for the condemned.” In the alternative, hanging is an option that has been approved by lawmakers in Delaware, New Hampshire and Washington. And Alabama is “fully capable” of approving those execution methods as well, the appeal said. Also, Marcus wrote, the law is clear. Inmates challenging a method of execution must prove there is an alternative method of execution “that is feasible, readily implemented and in fact significantly reduces the risk of pain posed by the state’s planned method of execution,” he said. “The Alabama legislature is free to choose any method of execution that it deems appropriate, subject only to the constraints of the United States Constitution,” Marcus wrote. Judge Wilson concurred in the result only but wrote separately to explain his disagreement with binding law. A federal jury on Monday ruled in Fort Lauderdale banker Alan Levan's favor on all claims filed by the Securities and Exchange Commission. The SEC alleged Levan had misled investors about the health of certain real estate loans in Fort Lauderdale-based BankAtlantic's portfolio leading into the recession. The agency also claimed Levan's company BBX Capital Corp., which sold the bank in 2012, failed to properly account for loans in public disclosures. It was the second SEC trial for BBX and Levan on the same claims. The first trial in 2014 ended with some jury findings against the defendants, a temporary ban on Levan running a public company and millions of dollars in fines. The appellate court overturned some pretrial rulings and sent the case back for another six-week trial in Miami before U.S. District Judge Darrin Gayles. Levan and BBX also settled an earlier case brought by shareholders. "I am pleased this regrettable nine-year ordeal is finally over and has ended in complete exoneration," Levan said in a statement. "This frivolous action by the SEC was clearly motivated either by incompetence or by malicious self-interest so the agency could say it did something to somebody other than watch the banking system collapse under its nose. I am ready to move on and build on the considerable success we have enjoyed at BBX Capital, which has prospered despite the unfair and unwarranted burden imposed on us by this SEC witch hunt." 1. Trump is going to nominate Kevin Newsom to the 11th Circuit this week. Newsom, a law school classmate of mine, is well-qualified (former Alabama SG, former Souter clerk). He is one of nine nominations set to occur this week, via NY Times. 2. Prosecutors have plagiarized a blog post in amicus brief on death penalty case (via Jacksonville Times). Doh! The Florida Prosecuting Attorneys Association apparently copied a defense attorney’s blog post in a critical brief dealing with whether prosecutors have the right to reject the death penalty. The brief signed by Buddy Jacobs, an attorney and the longtime lobbyist for the prosecutors association, argued that an Orlando prosecutor deserved to have first-degree murder cases taken away from her after she said she wouldn’t seek the death penalty. The brief was signed by Jacobs and two other attorneys in his Fernandina Beach law firm. Part of that brief is exactly copied from Richard Hornsby, an Orlando defense attorney. Hornsby posted last month on his blog why he thought Gov. Rick Scott was justified in his decision to re-assign capital murder cases away from State Attorney Aramis Ayala. 3. The Corrine Brown trial is set to go to closing today, via Florida Times-Union. That's up in Jacksonville. Apparently she cried on the witness stand on Friday. Any thoughts on whether she will walk? U.S. Senators Marco Rubio (R-FL) and Bill Nelson (D-FL) will once again constitute the Florida Federal Judicial Nominating Commission (JNC) to identify highly qualified individuals as finalists to become U.S. district judges in each of the three judicial districts in Florida. Today, it was announced that Carlos López-Cantera will serve as statewide chair of Florida’s Federal JNC. UPDATE -- she was convicted. No joke. The U.S. Capitol Police officer who decided to arrest an activist because she briefly laughed during Attorney General Jeff Sessions’ confirmation hearing in January is a rookie cop who had never conducted an arrest before nor worked at a congressional hearing. Nevertheless, prosecutors persisted this week in pursuing charges against the 61-year-old woman the rookie had taken into custody. A video shot by a HuffPost reporter that shows Fairooz being arrested was included as evidence in the trial, which will continue at Superior Court in D.C. on Tuesday. The video jurors saw Monday shows Coronado taking Fairooz into custody as she’s assisted by fellow officers. The Supreme Court handed a partial but significant victory to cities today, holding that the Fair Housing Act allows the city of Miami to bring a lawsuit alleging that two banks, Bank of America and Wells Fargo, violated the law when they issued riskier but more costly mortgages to minority customers than they had offered to white borrowers. But it was hardly a complete win for the city, as the court also ruled that the lower court should have applied a tougher test to determine whether the city can recover compensation for its losses. This means that the case will now return to the lower court for it to decide whether there is enough of a connection between the banks’ lending practices and the city’s economic injuries to hold the banks liable. That means that Judge D will get the case back. Fun times.